What will houses and buildings look like in the future? Ten years from now, we will probably be eating food that has yet to be invented. Even if it’s green gunk cultured in a petrie dish, we will eat it with gusto, knowing that we are helping to save the planet. Similarly, after a hundred years under a rock, the motor vehicle industry is beginning to evolve, despite the design of the latest Proton Saga which looks like something my father would have been proud to own. In 10 years, we may all be driving hybrids or electric cars. The traditional rowdy Mat Rempits may have given way to a new generation who will steal up behind old ladies in their silent electric MPVs and flatten them before they have a chance to look round. Nevertheless, this will all be accepted as the price of progress. A fight for survival is the most powerful incentive to evolution, whether you’re a microbe or a personal financial consultant. Sadly there is a complacency pervading the housing industry which has produced little innovation in the last 30 years. Arguably, those who live in link houses will only aspire to bigger ones. The more fortunate in life will buy a bungalow with lots of roof, windows from Alcatraz and corinthian columns framing the entrance portico. But there is little experimentation. Cluster houses were a flop, timber is passé, and “modern tropical” has become a catchphrase for koi ponds and bathrooms for exhibitionists. Even though speculative housing needs to have broad appeal, niche developers have been slow to emerge with a response to the fundamental changes in the Klang Valley demographics. A younger middle class may not be so obsessed with the ownership of landed property and may focus more on lifestyle. The Verve Suites in Mont Kiara are a rare and successful example of this philosophy. Britain has seen an interesting response to changing demand patterns. The high divorce rate has produced a huge band of middle-aged singles looking for companionship, but blended with a desire for some privacy. The emergent real estate solution is a small group of separate living units, linked to a communal lounge and recreation area. This sounds to me a lot like my student digs of the 1960s. I’m sure it’s much more sophisticated although it doubtless shares the same cherished objective of mindless bonking. 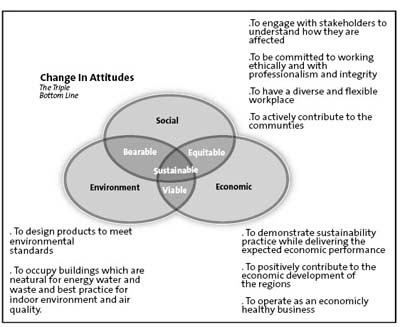 If one is looking for a single major evolutionary shift in global real estate markets, the buzzword is probably ‘sustainability.’ Exactly what comprises sustainability is well illustrated on this chart. Phrases such as “best practice” and “diverse and flexible workplace” may sound alien and idealistic but they are objectives which are rapidly becoming the expectations of any multinational company. This year’s expectations are next year’s demands, so we need to be aware of these changing standards and plan for them. In practical terms, the “triple bottom line” involves three elements: high technical specifications, environmental responsibility and financial viability. A need for high technical specifications now applies to practically any new office development. Few businesses can now operate without IT. Even suburban buildings which are traditionally the refuge of the cost-conscious, now have to meet minimum technical requirements. Environmental responsibility encompasses the provision of a pleasant workspace and office buildings with in-house facilities such as a gymnasium, senior staff canteen and even a swimming pool are becoming popular. Equally importantly, energy-saving is becoming and will remain a major issue, particularly with the introduction of internationally accepted “green” standards by which buildings can be graded. Finally of course, financial viability is paramount. “Green” buildings with attractive facilities are not cheap to develop and so far, the only incentive to incurring this additional cost is the belief that sustainability will become crucial to lettability. Over time, I believe this extra cost will be accepted as inevitable and capital values will rise, like social values, to meet the market. Property developer UEM Land Bhd's plan to sell 17.4ha of land to one of Dubai's largest private developers for RM396.5 million has fallen through. The deal, which was first struck in June 2008, was for Damac Properties (Malaysia) Sdn Bhd to develop three parcels of commercial land that forms part of Puteri Harbour at Nusajaya in Johor. Under a sale and purchase agreement (SPA) signed in June 2008, both sides were to have agreed to the conditions of the agreement by June 2009. "The termination will have no impact on our financial results as the expected revenue from this proposed transaction has not been recognised in our accounts," UEM Land managing director and chief executive officer Wan Abdullah Wan Ibrahim said in a state-ment yesterday. UEM Land and Damac had been in discussions on certain issues relating to the conditions of the deal. However, they were not able to come to an agreement on these issues and have now agreed for the SPA to be terminated. Damac on June 16 told UEM Land it did not agree to further extensions of the extended approval period, causing the SPA to lapse. "Given the current global economic conditions and the impact on many companies and countries including those in the Middle East, we felt that there is no point in pursuing the matter and that a termination of the SPA was in UEM Land's best interest," Wan Abdullah said. "Our aim is to accelerate the momentum of development and investment in Puteri Harbour. The foundation has already been laid and we have received strong interests from potential investors to partner us in developing the area. We are confident of concluding some of these deals in the near future," he added. News reports as recent as April had already raised questions regarding the deal, given Damac's troubles following the property bubble bursting in Dubai beginning end of last year. In December 2008, Damac cut 200 jobs or 2.5 per cent of its workforce. The company has also called off its Palm Springs project, a 25-storey residential and resort development, planned for the Jebel Ali Palm in Dubai. UEM Land has another Dubai-based partner in Limitless LLC as a major investor in Nusajaya. Its joint venture is through Haute Properties Sdn Bhd, which will develop a 44.4ha residential project in Puteri Harbour with an initial investment of RM241.8 million. It is understood that a layout for this project has already been submitted, and will continue as planned, with completion scheduled for 2013 with an estimated gross development value of more than RM1.5 billion. PETALING JAYA: UEM Land Bhd’s agreement with Damac Properties (M) Sdn Bhd for the RM396mil sale of 43.5 acres in Puteri Harbour, Nusajaya has lapsed. UEM Land told Bursa Malaysia yesterday Damac had failed to resolve issues relating to the conditions of the purchase agreement within the agreed period. Managing director and chief executive officer Wan Abdullah Wan Ibrahim said the termination would have no impact on the company’s financial results as the expected revenue from this proposed transaction had not been recognised in its accounts. “The exit of Damac would not impact the development of Nusajaya as we are currently in talks with new developers to take over its place,” it said. According to sources, developers from Australia and Singapore have expressed interest to purchase parcels of land in Puteri Harbour, the waterfront development in Nusajaya. KUALA LUMPUR: UEM Land Holdings Bhd share price fell this morning after Damac Properties (M) Sdn Bhd, which is part of Dubai's Damac Group, pulled out of a deal with UEM Land to acquire a piece of land for RM396.44 million in Nusajaya, Iskandar Malaysia. At 9.40am, UEM Land was down 9 sen to RM1.74. It was also among the most actively traded counters with 10.22 million shares done in early trade. Yesterday, UEM Land said it had received notification on Tuesday that Damac would not be interested in further extending the sales and purchase agreement (SPA), which was signed on June 12 last year. The company told Bursa Malaysia that under the terms of the SPA, the period to fulfil the condition would expire 12 months from the date of the SPA unless extended by mutual agreement by both parties. "The parties had been in discussions on certain issues relating to the conditions precedent and a possible extension of the extended approval period. However, on Tuesday, UEM Land received notification stating that they are not agreeable to further extension of the extended approval period," it said. UEM Land said the SPA relating to the proposed disposal had lapsed and was of no further effect. GAMING group Genting Bhd says the casino resort it is building in Singapore is on track for a soft opening in the first quarter of next year and that its construction cost is within the increased budget. "Genting International revised the budget earlier because the project had overrun the initial budget. At this point, it is within the enlarged budget," Genting chairman and chief executive Tan Sri Lim Kok Thay told shareholders during its annual meeting in Kuala Lumpur yesterday. Genting International, recently renamed Genting Singapore plc, said earlier this year that its investment in the casino resort on Sentosa Island was expected to increase to S$6.6 billion from S$6 billion (RM16 billion from RM14.5 billion). "The cost has increased because we have added and changed some specifications so that we will end up with a much, much better project from the original," Lim said. He added that the project, which boasts of a Universal Studio theme park, Hard Rock Hotel and the world's biggest oceanarium, will open in stages, starting with the casino. "This is a large project. It is not prudent to launch all at one go although that's the ideal. The plan is to open the gaming part first to get cash flow intact," Lim said. Genting Singapore is a 54.4 per cent-owned subsidiary of the group. Lim quelled speculation that Genting was eyeing an ultimate investment in Macau through the recent purchase of a 3.2 per cent stake in MGM Mirage and US$100 million (RM353 million) of its bonds. MGM Mirage, a major casino operator on the Las Vegas strip, is part of a joint venture in Macau. "We are treating it as an investment at the moment, to maximise returns on cash rather than keeping it in deposits. The plan is no more than that," he said. "The bond is secured against two top quality assets and, if repayments failed, we can collect the collateral. The management recognises that this is a good investment. "As we get to know MGM better, we hope we can strike out some marketing alliances." Lim also said that despite the recession in the UK, the group expects its investments there "to turn in profits at the same time as projected when it made the acquisitions". The group acquired control of Stanley Leisure, the UK's largest casino operator, in October 2006. "The business has got a lot of potential," Lim said. Already a major player in the UK, the unit can later expand to Europe, which is a "greenfield for gaming". "It will be good to get the timing right for investment, but no one has predicted this round of financial crisis." On another development, Lim said that Genting was just a "minor player" in Rank Group, the UK's bingo hall operator in which Tan Sri Quek Leng Chan's Guoco has reportedly built up a 24.1 per cent stake as of last October. Genting owns about 11 per cent of Rank, according to media reports. KUALA LUMPUR: The serviced apartment sector in Hong Kong has been relatively more resilient than the luxury residential market during the current economic downturn, according to real estate services agency Colliers International (Hong Kong) Ltd. According to the "Serviced Apartments Overview - June 2009" report published by Colliers International recently, between August 2008 and April 2009, the average rental of serviced apartments registered a -12.9% fall compared with a fall of -24.6% for luxury residential leasing property. The pace of serviced apartment rental decline slowed to -1.7% month-on-month (m-o-m) in April 2009 to HK$44.78 psf per month. The average rental of serviced apartments decreased 6.4% quarter-on-quarter (q-o-q) in 4Q2008 and 5.4% q-o-q in 1Q2009. Average luxury residential rentals fell 13% q-o-q in 4Q2008, while its downward adjustment narrowed to 8% q-o-q in 1Q2009 as inexpensive opportunities were snapped up by early-bird occupiers. The rate of decline in rentals tapered off further to less than 2% m-o-m, with average unit rate at HK$34.87 psf per month. Individual serviced apartments of medium-to-large sizes experienced a double-digit fall in rental. Director of research and advisory Simon Lo said in a statement that a number of occupiers had chosen to relocate to cheaper areas, or to downgrade their accommodation in terms of size or quality due to the general tightening in housing allowances. "Sustained weakness in occupational demand and the cost-cutting initiatives among multinational companies remain the major challenges for the overall residential leasing market," he added. Colliers said the leasing demand has dropped significantly, and some vendors have changed their leasing strategies by offering competitive rentals to fill their units in view of a demand contraction. Some 75% of serviced apartment tenants have also chosen short term leases of less than six months, it added. Colliers expects rentals in the luxury residential market in Hong Kong to fall 12% over the next 12 months, while the potential rental downslide in the serviced apartment sector will be limited to 8% during the same period, as the latter will continue to be resilient with its services and flexible lease terms.